A Gray Water Recycling Product? Back in early February, we were contacted by a young man from Japan that wanted to find out more about RV boondocking. He is with a company that is developing a "personal water recycling system". Skeptical, but intrigued, I invited them to come to our Boondocking Rally (after I verified it wasn't some type of scam). Then I didn't hear from them until the Boondocking Rally was over. Another young man by the name of Ryo contacted us last week. He is one of the three co-founders of the company, WOTA, and said they would still like to get together with us. Here is a short video from their website. They had been at a conference in Austin, Texas and were on their way back to California to head back to Tokyo. After telling them we would be moving from southern California to Pahrump, they changed their travel plans to drive to Pahrump so they could meet with us. We were impressed by that. So, this morning (Saturday) around 10:00 a.m., they pulled into Wine Ridge Resort in their Class C motorhome, an older rental motorhome they had bought from a dealership. Four young Japanese fellows came out with big smiles. We had all three co-founders - Ryo, Riki (CEO), and Shohei - and one other gentlemen that handles most of their lab testing. Ryo speaks very good English and Riki speaks understandable English if we listened very closely. The other two understood our English. Of course, we speak zero Japanese, so we were thankful Ryo was easy to understand and could translate for us. 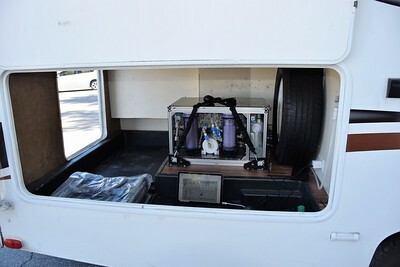 They didn't waste any time opening up the storage compartment of the RV and showing us a prototype of their Rainbox, a water filtering and purification system, which recycles shower water, strips out impurities (soap, etc.) and sends them to the black tank, and pumps the recycled, clean water back into the fresh water tank to be re-used over and over again. It also softens the water that goes back into the fresh water tank. Our very first impression was "Wow, that's big". And we made it very clear that if they were considering this as an RV application, it would have to be a lot smaller. This is their first RV prototype and they are still working on improvements. Right now, it can recycle shower water, bathroom sink water, and laundry wastewater, but it can't yet handle the oil and grease that may go down a kitchen sink. So, if you have a separate "galley" gray water tank for the kitchen drain, this works better as it can be attached to the other gray water tank. But if all your gray water goes into one tank, the device in its current state won't work and if, as in some RVs, all the wastewater, black and gray, goes into a single tank, that definitely won't work. They told us the recycled water meets Japanese drinking water standards, but they aren't going to market it that way. It would be more for those that don't drink the water from their fresh water holding tanks (many of us boondockers don't drink the water from our tanks) or those that may want to install a second fresh water tank. It does need electricity to run, but they said it only takes about 20 minutes to recycle their gray tank, no big deal if you turn on a generator when you are ready to recycle. They also said it would take about 20 amps on a 12-volt system, so it could be powered with a battery bank and an inverter. However, if they make it smaller, the recycling time would take longer. After the demonstration and answering several of our questions, we went inside where they asked us many more questions. I think they are still trying to wrap their heads around the potential applications. 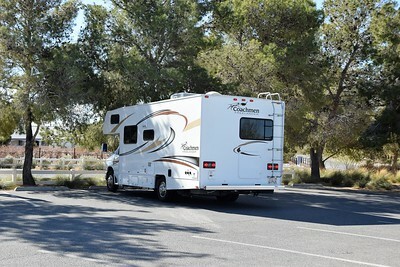 They are targeting boondockers, but we attempted to impart to them that this device would have limited appeal as the percentage of RVers that boondock enough to see the benefits is very small in the overall scheme of things. RV manufacturers certainly wouldn't see it as having enough mass appeal to include it in their models as standard equipment or even an option. So we think it would have to be an "after market" product, and we're not sure that dealers would be all that interested in training their people to do installations until they got a worthwhile number of requests. We also tried to tell them that most boondockers are pretty frugal, so the price point would have to be low. They are currently taking pre-orders of 20 units to be delivered only in California, and the opening price is $9,980 plus tax. They hope to bring the price down to at least half of that, but we're thinking it would have to go well below that figure, and I just don't know if they can do it. I said many times "I'm not trying to burst your bubble, but ....". Linda came up with those last three benefits which would open the market to more than just boondockers. We kept coming back to the size. 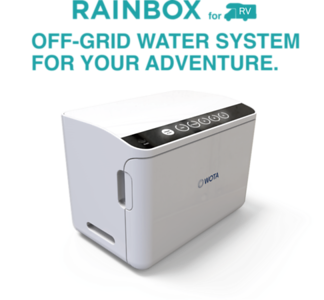 Larger RVs might have space to install a Rainbox (unless you are a full-timer in which case it might be more difficult to create space), but it's the smaller RVs with their smaller holding tanks that would benefit the most, and they just wouldn't have room for it at its current size. Linda suggested a portable model. What if it didn't have to be "built in" and could be stored for travel like a portable generator or water softening system? 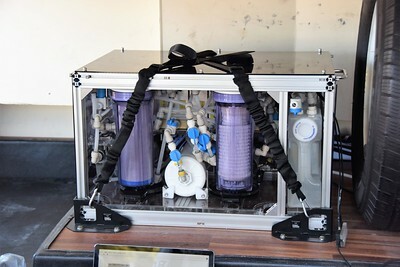 Could it just be brought out when needed where it sits outside with a quick-connect to the gray tank and another quick-connect to the fresh water tank? Just a thought. We brainstormed other potential uses and provided numerous suggestions. We advised them on the best places to demonstrate it to get feedback from RVers. I thought that manufacturers of "tiny houses" might be more interested than RV manufacturers in building them into their structures. And we feel like owners of larger boats could be a really good target market. Anyway, we were certainly intrigued and we enjoyed spending time with these young men. We haven't established any type of relationship with WOTA, but we are curious. So, what do you think? Is this something you would be interested in? Why or why not? If you would be interested, what size should it be? What would you pay for something that recycles your gray water? Any other feedback? Boats just go three miles offshore and let it rip! I think the ideas about the parks with water and electric but no sewer are great! It would allow campers to use the toilet facilities of the park but still be able to enjoy the benefits of their bathroom sinks and showers. That's a big bonus, but at half the price it's still questionable value for the average RVer. It great to see the entrepreneurial spirit alive and well! This would be of limited interest for use. Even at price of $2k-$3k. We travel 6 to 10 months of the year (still have a sticks & bricks) and dry camp or boondock much of the time. However only about once every year or two, do we stay without moving for more than 7 days, the amount of time it takes for use to comfortably go without dumping and taking on water or dumping. Also I think there are a limited number of RV'ers who long term dry camp or boondock which would really benefit from a system like this. I know this was developed for the RV industry but I can also foresee that this may be needed in rural areas where and when water is at a premium. We still have areas where people are using cisterns and hauling water to meet their needs. It could allow rural residents to have an almost unlimited supply of their own water by recycling. I agree with Al and Sharon. This could be a viable alternative to a $30,000 septic tank and field. Combine it with a composting toilet and grease trap and I think would be good to go. 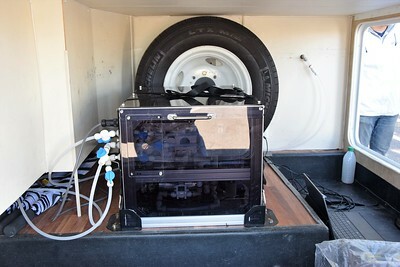 For RVs and boats without desalination, at 1/3-1/2 the cost maybe. We boondock often but also enjoy forest CG’s. At those places, water is often available though dump is not. Our big tanks allow 2 weeks easily and 3 if we conserve. By then it’s time to move anyway. Don’t see RV’s as being their market at that price point and size. However, N AZ around Flagstaff has a cracked aquifer so off-grid cabins there must depend on rain cisterns and trucked in water. Some islands in the Caribbean have the same problem with water availability. For places like that, this product would be ideal.